Previously I was using Xfce4. Then, because of the heavy working environment, I tried the lighter desktop environment, LXDE. But still, it has some limitations that made me choose to use Openbox window manager only. 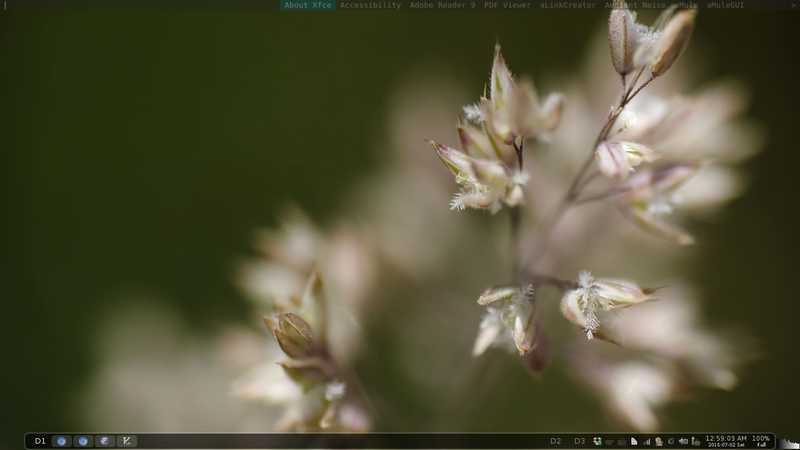 Xfce4 is lightweight comparing to GNOME or KDE. I like it, because of the conventional design like the task manager. 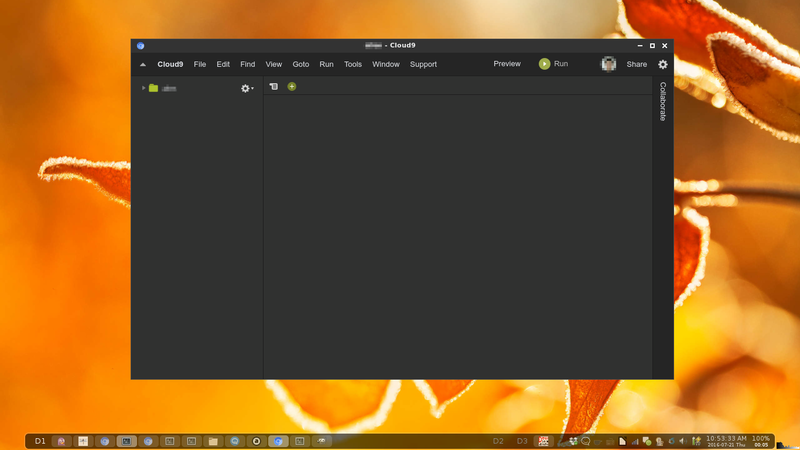 Furthermore another thing I like is the “aerosnap” feature like Windows, which I can view the two windows side by side. However, when running Windows in VirtualBox and other applications, I can feel the obvious slowness in the computer. It is really reducing my working performance. That is why I decided to change to LXDE. LXDE is lighter than Xfce4. So, running a lot of heavy applications does not slow down the computer like Xfce4. But there was one issue I faced. The LXDE pager (workspace) does not allow me to drag and drop the applications to move among the workspaces. As a result, I decided to use something lighter than Xfce4 and I can drag and drop the applications among the workspaces easily. I had experienced Openbox with tint2 when I was using my old laptop. Openbox is nice and highly customisable. Tint2 allows me to set number of workspaces, and easily to move the applications to other workspaces. However, tint2 does not have applets or plugins like Xfce4 or LXDE. There is one feature I need, that is to see CPU usage, so that I know whether there is any application causes high CPU usage. As a result, I installed Conky and display the CPU usage at the corner of the desktop. Cloud9 is a web-based IDE good for collaboration and online development. You can store your large project on the remote server, and use any computer including netbook with a web browser to develop your system. Now, the problem I faced when using C9 on my Chromium. Firstly, the address bar, tabs, and bookmarks occupy some space in the window. This results a non-editor look and feel. This makes me feel lacking of something. Secondly, the worst part is the shortcut key like Ctrl+W. By pressing this shortcut key, it will invoke the web browser closing window instead of the C9 shortcut key. Meaning, the shortcut key of the web browser has higher precedence than C9 itself. I looked for the C9 official Chrome extension, namely Cloud9, but it just works like a bookmark. I tried also Cloud 9 IDE Shortcut. It works better than official Cloud9 Chrome extension. Yet, I need to enter my username and password for the first time. Another drawback is the missing of the window icons like minimize, maximize/restore, and close, and title bar, which results difficulty to resize and maximize/restore. Yay! Now I can use the shortcut keys and it looks like native text editor! If you are serious, you can write the manifest.json to create the C9 web app, then you can have a custom icon instead of Chromium icon. I have an HP 1T external HDD. It is dying. Sh*t! So, I made my final struggling onto it. Though it is not 100% work as planned, I still have around 320G usable space. Firstly, I found that some files cannot be deleted, I had no choice but plug out the USB cable manually. Try to chkdsk with Windows since it is NTFS partition, but the chkdsk stopped and no response during the progress. Then I know, these were the bad signs. So, have to avoid using it and get a new HDD, and move whatever files able to be moved. I use Linux instead of Windows, because copying out the files with Windows is damn slow. So, I have no choice but to use Linux. During copying from this pity HDD to the new HDD, the copying process will stop without warning, and the HDD failed to work. Worst, there was no way to cancel the operation, only solution to plug it out. I repeated this procedure approximately 60-70 times (heuristic guess only). There is one thing I have to mention, that is S.M.A.R.T. I had enabled it on the external HDD, but it did not show any useful feature to SAVE my date. After copying out primary data and giving up some secondary data, I decided to re-format it as NTFS. Though I very dislike Windows, NTFS is still the main stream. NTFS and FAT32 are widely supported by the devices, for instance, LG video player. I also considered exFAT, but it is not as good as NTFS supported by Linux. So, booted into Windows, plugged in the USB cable, format the disk without “Quick Format”, because I intended to have a thorough “chkdsk” scanning for bad sector. Unfortunately, it was DAMN slow. To increase from 0% to 1% requires about 30 minutes. How am I going to live my following life? Then I cancelled the format and gave up NTFS. usb 2-2: LPM exit latency is zeroed, disabling LPM. I concluded that it is not just bad sectors/blocks, but just failed to read the blocks. So, I assumed that mkfs.ext4 with “-c” or even fsck.ext4 will not solve my problem. Those bad sectors should never be accessed. So, I decided to give up those sectors, meaning, skip those factors from the partitions. This can be done by using fdisk or cfdisk, creating the partitions based on the “sector” unit instead of size. We can create the partition to occupy the bad sectors area, then create next partition after it, and then delete the partition that has bad sectors. Then, the next question is how to find the bad sectors. mkfs.ext4 and fsck.ext4 cannot solve, because they are checking for the bad sectors thoroughly through the partition. The solution is to use “badblocks”. There are two things have to know, i) sector and ii) block. They are different things. badblocks command can identify the bad blocks, but not the bad sectors. However, fdisk allows us to get the total number of the sectors. The total number of the sectors of the hard disk is 1953525168. So, that is the total number of blocks, 976762584. And you can do the calculation, 976762584*2 = 1953525168. So, 1 block = 2 sectors. This is important information, because when we use the badblocks, the values are shown in block unit. But when we want to create partitions, we are using sector unit. which is the first block (0) until the last block (976762584 -1). Unfortunately, because the hard disk has critical failure, I cannot implement the next stage. In my expectation, the hard disk may have multiple large, contiguous, and safe space. For example, 0-25% from the beginning is safe, and 60-100% is safe. As a result, I can create 2 partitions for these space. This is what I actually want. If this really happen, then I can use the LVM so that I can combine both partitions as a logical volume, and finally mkfs on it. But since it does not happen, I cannot test on the LVM. Since I am working as freelance developer, I spent most of my “otaku” time with Animenfo Radio. Now, when listening with some nice songs you like, and you would like to know what the song is, then you can use Shazam to detect it. But using Shazam requires you to turn on your volume and use your mobile phone to detect it. What if, you are listening the songs with your ear-phone? There are two options, one is “Built-in Audio Analog Stereo”, another is “Monitor of Built-in Audio Analog Stereo”. Choose the “Monitor” something will redirect your computer audio output to your computer recorder (input). Then, the website like Midomi will get what you are listening, and submit for a search! Yeah! No Shazam, and you can search when you are listening with the ear-phone.